Respondent :- State Of U.P. Thru. Prin. Secy. Basic Education, Lko & Ors. Heard Sri Upendra Nath Misra, learned counsel for the petitioners. Sri Upendra Nath Misra has concluded his arguments. Put up tomorrow i.e. 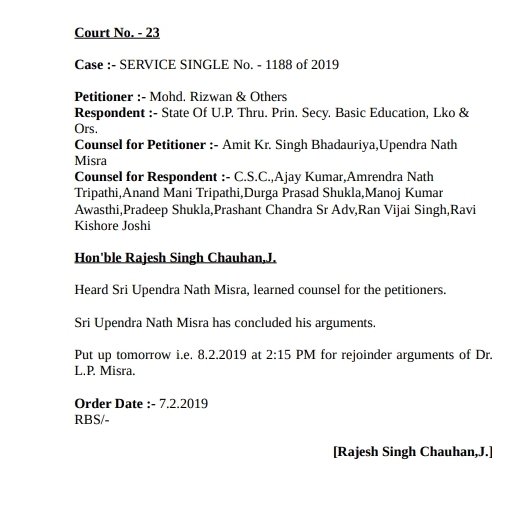 8.2.2019 at 2:15 PM for rejoinder arguments of Dr. L.P. Misra. याचिकाकर्ताओं के वकील श्री उपेन्द्र नाथ मिश्रा, को सुना.